According to their website, the West Virginia Department of Environmental Protection Office of Oil and Gas is responsible for over 55,000 active and 12,000 inactive oil and gas wells in the state. To obtain a scope of the Marcellus Shale activity, I queried that state’s online permit and well databases on November 1, 2010. The search of permitting data yielded 11,836 records, however a closer look at the data shows that there have been only 1,474 permit applications received from 1,464 wells, with the rest of the dataset providing detailed information about the same locations. Of the total number of applications, a total of 590 are horizontal. There are a total of 1,338 permits that have been issued, of which 533 are horizontal. From the well database, there are 1,463 Marcellus Shale wells, 1,334 of which are gas wells, one is a commercial brine disposal well, and the remaining 128 wells of an unspecified type. 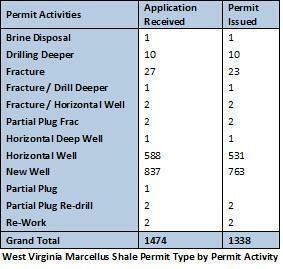 Since as of November 1, 2010 there are only 1,338 permits issued for the Marcellus Shale, those unspecified wells are a curious presence. Results of Permit Applications. Green dots are approved permits, yellow dots are permits that have been returned, and red dots are rejected permits. Click the map for more information. Unlike other states in which violation data has had to be requested, the West Virginia DEP has separate spills and violation databases available on their website. The spills database includes 463 records between the dates of January 1, 2000 and September 30, 2010, while the violation data includes an additional 245 records from the same time frame. Even together, these totals are less than one tenth of the number of violations that have occurred in Pennsylvania since 2007, although these lists do no not seem to include much of the administrative and abandoned well violations that are so prominent in the Pennsylvania data. I should also note that the 67,000 current and abandoned wells that West Virginia oversees is roughly half of Pennsylvania’s 129,000 known oil and gas locations. I condensed the original list of 134 different spill types into six categories to facilitate analysis. Most of the instances of merging categories were straightforward. For example, brine spills and wastewater spills clearly belong together. A few, such as “Substance from gas well” required some degree of guesswork. The other violation database includes the relevant West Virginia legal code. Most of the categories seem logical, however a few, such as “Libraries” and “Religious, Educational, and Nonprofit” seem to be illogical oil and gas violation categories. Libraries may well be a mistake, having come up only once, but with 41 instances, it seems likely that the latter legal chapter has some relevant code for the oil and gas industry. As with the spills data, this dataset includes numerous entries with multiple violations, resulting in a total number of violations that is higher than the number of records in the online database. >This post was edited on 11-11-2010. >My comment above links to a dynamic snapshot of what Anonymous was asking for. Just for the record, the static map was also done through FracTracker's DataTool via Google Earth. I was trying out our tools, but I see that the one I usually use is better. >You can go here to view this map more dynamically. Also, look for an updated version in the next couple of days. >Can you make the map of Marcellus wells a larger picture format or a zoom in/zoom out map so we can see if there is any drilling going on where mountaintop removal mines are. We suspect that's true as I see black spots in Kanawha County and around SW WV. It's hard to tell with the picture so small.